Easily my favorite Gladwell book. I found it relevant and useful. My favorite book when it comes to combining sociology and business. So many gems it has become an undeniable point of reference. Malcolm Gladwell never disappoints. This is an in depth look into trends, what creates them and epidemic of virality. An insightful book, but not earth-shattering. It fades in the later chapters. Having Gladwell as the narrator is a plus. Great listen! 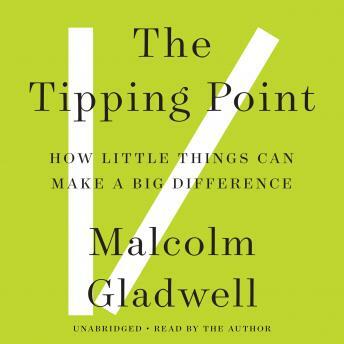 Malcom Gladwell is a fantastic narrator as well as writer. While there are no earth shattering insights, he does present solid evidence that challenges our tendency to associate great performers with "God given" talent. Rather showing when the data is aggregated, it is more likely that the "Greats" have some significant and similar contributing traits/factors that had a great effect on their becoming great. Great Read. His books are insightful, full of self challenges and reassurance . Well narrated . Great book. Such fascinating insights. After I read his books, I always feel like I walk away with so many new areas of knowledge that all connect in cool ways.